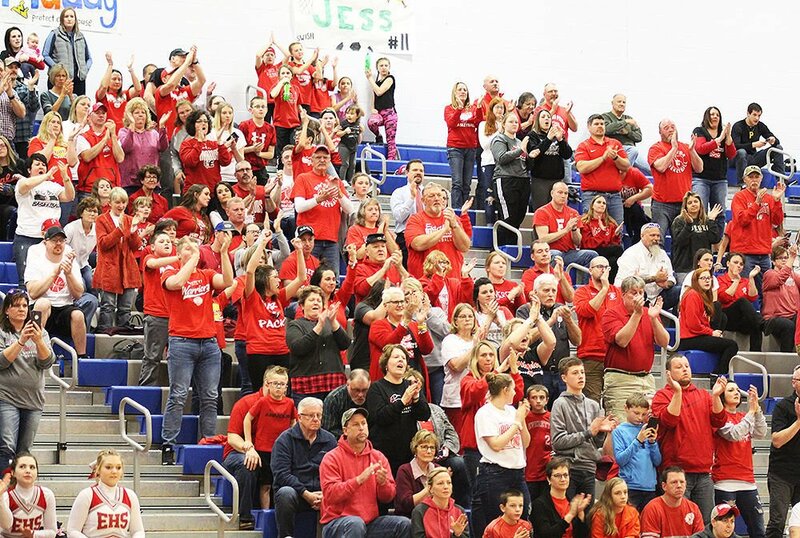 A large section of Everett supporters cheer late in the fourth quarter during the Lady Warriors’ 59-36 victory in the Class AA state quarterfinals on Friday night in Greensburg. Everett’s Alex Iseminger watches a free throw in the second half of Friday’s state quarterfinal game against Allegheny-Clarion Valley. Everett’s Gabby Bulger, right, battles for a loose ball with AC Valley’s Kylee Eaton on Friday night. The Lady Warriors beat the Lady Falcons 59-36 in a Class AA quarterfinal. Everett’s Brooke Colledge, middle, celebrates with teammates Kristen Ewing, left, Lizzy Jay, and Gabby Bulger as she also goes to embrace Madison Hicks after the Lady Warriors’ 59-36 victory in the Class AA quarterfinals on Friday. GREENSBURG — Even though she was struggling offensively during the middle stages of Friday night’s game, Brooke Colledge stayed true to the plan. The mindset paid off with Colledge collecting one of the biggest baskets of the contest that put Everett in a strong position to close things out against Allegheny-Clarion Valley. With the Lady Warriors holding a seven-point lead as time wound down in the third quarter, Colledge spotted up and drained a three-pointer just before the buzzer. From there, Everett dominated the final period en route to a 59-36 victory and a place in Monday’s Class AA state semifinals. The Lady Warriors are in the final four for the first time in school history. Colledge’s complimentary play to star guard Kaitlyn Maxwell early in the night gave Everett a healthy lead from the start. But with neither getting much going in the second and third quarters, along with Everett’s Madison Hicks leaving the game with an injury, AC Valley gathered momentum and had its deficit to within single digits on multiple occasions. Near the midway point of the third, Colledge drew a charge, then came up with that late three-pointer at the other end. She finished the game with 11 points, second to Maxwell’s 26 which led the Lady Warriors. One of the themes of this year’s Everett team is a family-like atmosphere, so losing Hicks wasn’t easy to watch. Colledge said the camaraderie of the squad coupled with a large Lady Warrior fanbase helped them persevere. “I was extremely upset because she’s a really good teammate,” Colledge said of Hicks. “She’s a big scorer, but we stuck together and got through it. “The support we have is amazing. I’m so happy to see everyone come out here. It’s just an amazing feeling to win because we’ve never been to this point before, and with one of our best players out.